Glossy buckthorn is a non-native tree that was introduced to Canada from Eurasia approximately 100 years ago. It can grow as tall as seven metres. Once used for landscaping, this tree has now become an invasive species. This species produces leaves early in the spring and keeps its leaves late into the fall. The dense thickets outcompete native vegetation. When glossy buckthorn is young, it often has multiple stems. As it matures, the stems merge into a tree trunk that can be up to 20 centimetres in diameter. The leaves are 1-3 centimetres long. Its leaves are oval shaped and slightly wavy, shiny on top and hairy underneath. The stems are a greenish colour, and the bark on older branches is grey-brown, speckled with white dots. The sapwood under the bark is yellow, and the heartwood at the centre of the plant is pink to orange. It produces greenish white flowers with five petals from late May to early September. Berries are produced from July to September. They are about the size of a pea, and as they ripen, the colour changes from green to red to a dark purple. Birds eat the berries and disperse the seeds inside. 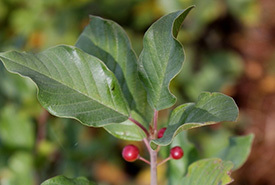 Glossy buckthorn's range extends from western Manitoba to eastern Nova Scotia, and as far south as Minnesota, Illinois, New Jersey and Tennessee. It grows in sunny, moist sites, in both wetlands and woodlands. At the Pugwash River Estuary in Nova Scotia, NCC staff, volunteers and the Friends of the Pugwash Estuary have focused their efforts into eradicating this species. In June 2014, approximately 5,000 stems of glossy buckthorn were removed in the area. Early detection is important in managing non-native invasive species. When the seedlings are small they can be pulled, especially when the ground is soft. When doing so, it is important to get as much of the root as it possible. Larger saplings and small trees can be cut, but doing so will not kill the plant as the stems will resprout vigorously so herbicide should be applied to cut stems. In heavily invaded sites, repeated effort is usually required over several years. Report sightings of invasive plants to your local stewardship council. Finding these invasions early is key to eradicating them. Clean your shoes or bicycle tires when moving from designated trails in different areas. Invasive plants are often spread accidentally from seeds stuck in treads.